First, I bought just over a pound of the 20% fat ground beef from New Seasons. I know 20% fat sounds like a lot when you see it next to the 10% or 5%, but when you're dealing with grilled burgers it equates to grilled goodness. Second, I cut a large yogurt container so I was left with a two-inch ring measuring from the rim. This is the form I used to mold the burgers. They actually make a tool for this you can buy for $20...or you can make your own. Thirds - I like to make 1/3 pound burgers..when you're dealing with 20% fat meat a good portion of the meat melts away and the 1/3 lb burger is actually just right. Separate the 1/3 lb portions into halves. Fourth, press one half of the meat into the mold. Make sure to really work it into the entire space. This will make sure your burger holds together when you cook it. I usually flip it and then press it in again. Once you've done this, with the meat still in the mold, sprinkle finely chopped fillings (cheddar cheese, green onions, red onions, blue cheese, mushrooms, sundried tomatoes, etc. what ever suits you). Then free-form the second half of the meat into a disk and place it over the other meat and toppings in the mold. Kind of like a top pice crust. Fifth, press the top all around and work specifically around the edges. Flip it over, use mold again, and do a final pressing. If you don't press it well enough you run the risk of the burger splitting open on the grill and loosing your fillings and maybe even part of your burger. Sixth, grill. The burgers in the image above are a little more well done than I usually like. It just happened. And we didn't have any tomatoes to top, but the green onions and lettuce were from our garden. With a little bacon, some BBQ sauce and mustard they still tasted soooo good. The amount of sugar and tapioca you use is relative, depending on the fruit’s quality and your taste. If you prefer a less sweet pie or if the fruit is especially sweet, use the lower sugar amount. If you like your pie juices fairly thick, or if the fruit is really juicy, then opt for the higher amount of tapioca. If you are using frozen fruit, measure it frozen, but let it thaw before filling the pie. If not, you run the risk of partially cooked fruit and undissolved tapioca. Take Pillsbury Pie Crusts out of the frig so it can come to room temperature..
Heat oven to 400-375 degrees. Toss fruit with sugar, lemon juice, vanilla extract, salt, pepper and tapioca. It’s really important to let it stand for 15 minutes. Unroll the first crust onto a lightly floured surface. Gently roll it so it is even. Don’t over roll it because it is already the right thickness. Do this for both crusts. Fit one piecrust into bottom of pie dish. Fill with fruit mixture. Lay second crust over top. Trim top and bottom dough edges to 1/2-inch beyond pan lip. Tuck this rim of dough underneath itself so that folded edge is flush with pan lip. Flute dough in your own fashion, or press with fork tines to seal. With the dough trimmings you can gently reform and rollout to make decorations. I made little strawberries and cut some little vines for the vents. If pie dough is very soft, place in freezer for 10 minutes before baking. Place pie on baking sheet in the middle of the oven; bake until top crust is golden, 20 to 25 minutes. Reduce oven temperature to 350 degrees and continue to bake until juices bubble and crust is golden brown, 30 to 40 minutes longer. *I've used other brands and they just don't turn out as well. I never liked potato salad much as a kid until I had my grandmas. All potato salad was kind of sweet or too mustardy or too mushy. Then at a family reunion of sorts when I was 11 or 12 I tried hers. It did not have sweet relish or mustard in it. And as for the mushy, I was able to get past that because of the first two omissions. About 15 years later I developed my own recipe for potato salad that I love. Today, while finishing off the last bit left over from a recent BBQ* I realized this is an easy one to post and share. Please forgive me as the only bits I had left for a picture were practically traces in my NS "bowl." While the poatoes are cooking, chop the celery - slicing it length-wise frist and then into little pieces. I even chop up the leafy parts on top. Chop onions into little pieces as well and add to a large bowl. Finally, chop olives. I like to cut them into quarters the long way. It's pretty, but you can chop them however you want. When the potatoes are cooled add all ingredients to a large bowl and toss with mayo. Add more or less mayo depending on your style. It's best if this can sit for an hour or so in the frig before you serve it, but it's really good anytime. *Ramon is coaching me on BBQ, which I recently learned is different from grilling. More to come on that in the next months. **Vegenaise is a great way to make this dish vegan if you're interested or have friends who you want to impress. Grapeseed Vegenaise is my favorite. ***If you don't own a pepper mill, now is the time! Fresh pepper makes everything better (even sweets I've recently discovered). If you're using the pre-ground stuff you might was well leave it out. It's stale and bland. Fresh ground pepper is amazing and SO worth it. *Fresh berries - black, blue, straw, ras. 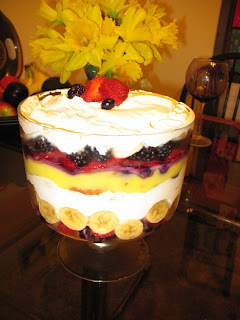 Trifle is sooooo yummy and a family favorite of mine. The ingredients are flexible so add what fruits you like. It's easy to make and best served in a bowl like the one pictured so the layers can be seen. The order you layer the ingredients is up to you, but this is how we do it. I like to lay down a little custard/pudding in the bottom to make it even since the dish is rounded. My Nan liked to use bird's custard, but I just use cooked vanilla pudding after it's cooled a bit. Then cover with pound cake; doesn't mater if there are openings, just do a layer - hint, but not a must, is to spread jam on one side of the pound cake. Next is berries (the jucies will soak into the pound cake and preserve the layered looked). When in season fresh rasberries, blueberries, blackberries and strawberries would be ideal. . . however it is still very tasty to use the frozen mixed berry pack from the store (thaw first). The next layer is banana's - sliced and arranged virtically around the glass for viewing purposes and then a complete layer across the rest laying face down. If you want to keep the color bright, sprinkle lemon juice over the bananas before putting the in the dish. The last layer is whipped cream - can use real, however cool whip maintains a firm texture a bit longer which is nice for the layering, and it taste just as good. Then start the next layer with pound cake on the whipped cream followed by custard and so on. Repeat the layers in order for as high as your bowl allows. The top layer should be whipped cream and garnished with a few pieces of friut. Keep refrigerated until served! When serving dig down through all of the layers with a spoon. There's nothing like the smell of fresh baked muffins - any time of day. Usually I try to have bananas on hand all the time for cereal, and when they overripe, they go into banana bread. Today I tried out the Moosewood muffin recipe, instead of my standard banana bread, and it looks great! It's nice because there is a standard base, and then you can add whatever variation you want to make your muffin flavor. It also could be made vegan fairly easily by using egg substitute. Apple: Add 2 C grated tart apples and 1 tsp fresh lemon zest to wet ingredients. Add 1/2 tsp cinnamon to dry ingredients. Optional: fold in chopped walnuts or pecans into batter. Banana: Add 1 1/2 C mashed ripe bananas to wet ingredients. 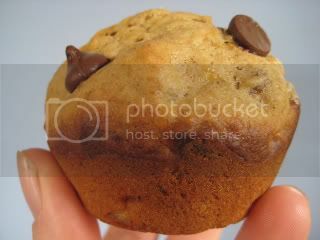 Optional: Fold in chopped nuts or chocolate chips into batter. Blueberry-Lemon: Add 1/2 C fresh or frozen blueberries and 1 Tbls fresh lemon zest to wet ingredients. Zucchini: Add 2 C grated zucchini to wet ingredients, and 1 tsp of cinnamon and 1/2 tsp of ground cardamom to dry ingredients. Fold 1/2 C raisins or currants, and 3/4 C chopped nuts if you like, into batter. In a large bowl, combine wet ingredients. In small bowl, combine dry ingredients. Add appropriate variation ingredients to wet or dry ingredients. Stir dry ingredients into wet until just combined. Fold in additional ingredients if necessary. Spoon batter into oiled standard muffin tins (makes 12), and bake for 20-25 minutes until toothpick comes out clean. If using mini muffin pans, bake 10-15 minutes. The other day I needed a quick dinner and I ended up with a delightful meal worth posting. Rinse and chop various veggies, in this case we had green and yellow squash, red and green bell peppers, yellow onions and whole cloves of garlic. Toss veggies with olive oil, salt and pepper. You can add fresh herbs too. We had thyme, rosemary, and oregano. Roast in glass baking dish until all veggies are cooked through and starting to brown, tossing at least once. Remove from oven and set aside to cool slightly. Cut thick slices of sourdough and lay them on a flat cookie sheet, covered in foil if you like foil. Scoop some of the roasted veggie mixture onto each slice of bread and spread it to the edges. Sprinkle with fresh chopped basil or other herb if you have it. Then layer some jack or mozzarella cheese over the top. Place in the oven on middle rack and watch until the cheese just starts to bubble and the edges of the bread are toasty. Remove from the oven and seve immediately. I didn't have the energy to make a whole salad to go with this so you can see I just tossed some avocado pieces with lemon juice, salt and pepper. Total time with pre-roasted veggies is about 10 minutes. If you pre-roast veggies they can be stored in the frig for a few days and you can have this meal for an easy lunch or brunch with an egg on top.